Pennsauken, NJ, January 8, 2019… NewTek Sensor Solutions introduces the MBB Series of Ultra-Precision Dimensional Gaging Probes engineered for highly accurate and repeatable measurement of dimensional parameters in a variety of quality control, industrial metrology, and inspection equipment applications. Offering excellent linearity, great precision and infinite resolution, these spring-loaded AC-LVDTs are ideal for use in roundness measurements, automotive testing, metal component gaging and materials testing. 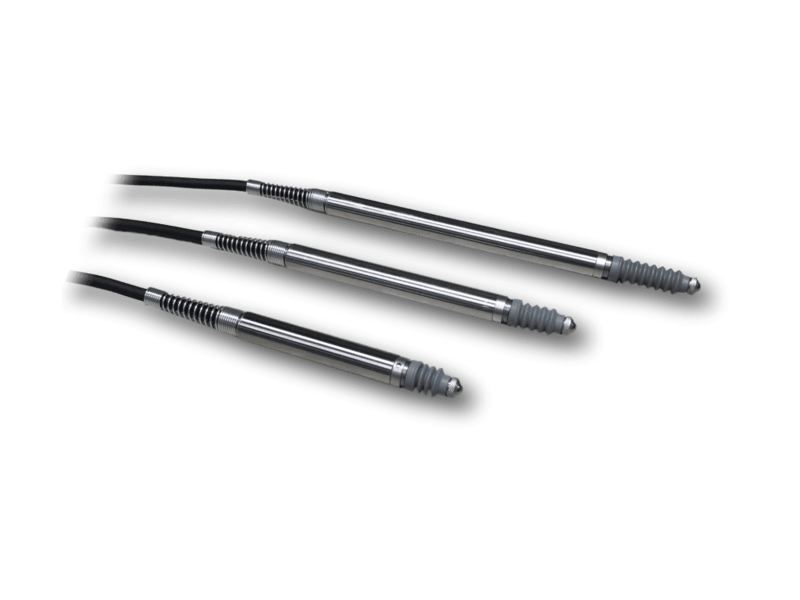 The MBB Series Gaging LVDT Probes feature a stainless-steel probe assembly and 8 mm diameter housing protected to IP-65. High-precision linear ball bearings provide for smooth probe movement without stiction and excellent repeatability. Incorporating a linear ball bearing assembly fitted to a non-rotating probe shaft, the MBB Series Gaging Probes produce an output voltage linearly proportional to the probe’s shaft position with minimal radial play. The use of an AC-operated LVDT for probe shaft displacement reduces errors due to friction, resulting in a highly precise measurement of the position of a target surface. More precise substitutes to mechanical position indicators and digital dial gages, the MBB Series of LVDT-based Dimensional Gaging Probes are extremely reliable with greater than 100 million cycles with linearity of less than 0.05% of full range. MBB Series GageingProbes are available in three standard ranges: ±.040 in (±1.0 mm), ±0.100” (±2.5 mm) and ±0.200” (±5.0mm). Units are available in 0.315 in (8 mm) and 0.375 in (9.5 mm) diameters. NewTek offers DC-operated signal conditioners such as the NTC Qwik-CAL™ Signal Conditioner that combine with the MBB Dimensional Gaging Probes to create a complete linear position gaging system that outputs statistical quality control data on manufactured parts. Mounting several gage probes in suitable fixtures also creates a system for “go/no/go” inspection of complex mechanical parts. For more information, refer to the website at https://www.newteksensors.com/products/mbb-series/ or contact Mike Marciante at 856-406-6877 to discuss your application requirements.